The Westosha Central High School boys volleyball team tapped a part of its past to help ensure a successful future. 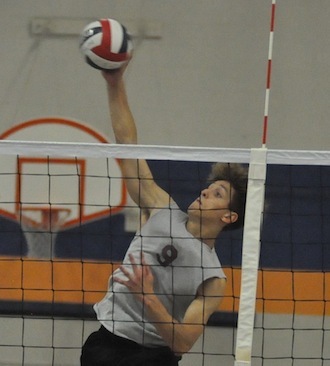 Central’s Alex Salerno will be one of the leading returners for the school volleyball team (Mike Ramczyk/The Report). Drew Cox, a former player in the program, is the new head coach. Cox takes over for Wayne Schultz, who previously served as the only coach in the program’s history. Schultz is now the head coach of girls volleyball at Burlington Catholic Central High School. Cox previously served as a varsity assistant for the Westosha Central girls volleyball program. The Falcons put forth a strong showing Sept. 8 at the Racine Invitational at Racine Park High School. The Falcons beat Park, Waukesha North and Wilmot in two sets. The Falcons lost to Racine St. Catherine’s/Racine Lutheran in two sets and took Mukwonago to three sets before losing 2 sets to 1. “This season, we are going to continue to grow as a program,” Cox said. “We have a ton of athletes on the team – we just have to mold them into volleyball players. Cox said key returnees include Alex Salerno, Joey Michelau, Luke Nosek, Zach Meyers, Tyler Horton, Cade Nichols, Cory Hinze and Paul Capelli. Freshman Bradley Bell, Dan Tompkins, Keagan Kearby and Jack Rose are expected to contribute. Cox said all involved are working on filling some big shoes. Setter Connor Muff earned all-state honors last season, and standout libero Jack Polick are also gone, having graduated. Cox said others who might have been key players either graduated or moved on from volleyball. Central’s 2017 season ended with a five-set loss to second-seeded Racine Horlick in a sectional semifinal Oct. 31 at Racine Horlick. The Falcons were seeded third in the sectional bracket.